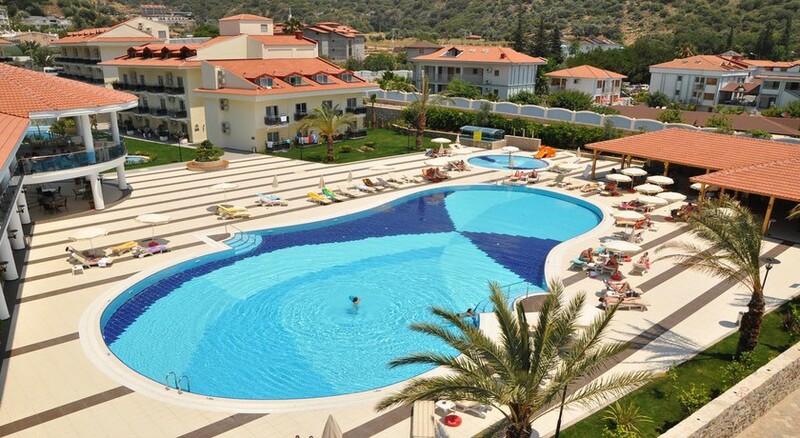 Situated in the Turkish resort of Olu Deniz, the Montebello Hotel is a family friendly property that offers everything you need for a relaxing break. The nearest beach is just a stone’s throw away from the hotel while there is an outdoor swimming pool, two waterslides, free WiFi and a spa at the property too. It is also nearby to several attractions including the Kayakoy Ghost Town, Butterfly Valley, an Aquapark and Telmessos Rock Tombs. The hotel features three different restaurants and three different bars too. The Montebello Hotel is perfect for couples, families or even groups who want a chilled out holiday to one of Turkey’s most popular resorts. 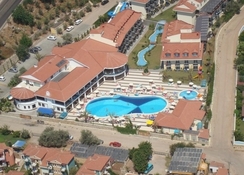 The Montebello Hotel is in the resort of Olu Deniz and is nearby to a variety of popular tourist attractions. This includes the Kayakoy Ghost Town (2.4 miles), Butterfly Valley (3.8 miles), an Aquapark (7.4 miles) and Telmessos Rock Tombs (4.5 miles). The Dalaman Airport is 21.5 miles away from the hotel. There are three room options at the hotel. Superior Double or Twin Rooms are suited to two guests while Superior Triple Rooms can accommodate three people. For families or larger groups there is the option of a Classic Family Room which is able to sleep four people. All the rooms at the hotel have air conditioning, a TV as well as a balcony. The Likya Restaurant is open for breakfast and lunch in a buffet setting while the Myra Restaurant is available for dinner. There is also a snack bar that has a selection of fast food, salads and a grill menu. There are three bars at the property too – the Likya Bar, Myra Bar and Sante Bar. There is a swimming pool at the hotel with waterslides as well as a children’s pool. Kids can also avail of the playground and entertainment programme while there are facilities for billiards and table tennis. Guests can indulge in the spa which provides a range of massage treatments as well as Turkish Baths and a sauna while the hotel also puts on an entertainment programme in the evening with live music and dances. There is a fitness centre and various tourist attractions that are easily reachable from the hotel.